Google Earth is an amazing free program that you could spend hours on flying to cities and viewing landscapes and geological features on. But, it required you download the application and install it in your desktop or laptop or even iPhone to be able to use it. Now, Google Maps has a Google Earth view which lets you get the same awesomeness right inside a browser without installing a hefty software in your computer. 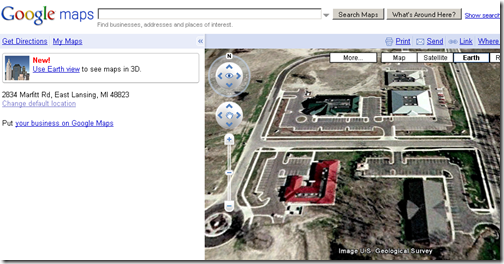 You can navigate your neighborhood or any part of the world in Google Earth view right from Google Maps. You do need to install a plugin for your browser to be able to do so. I believe this Google Earth view will prompt a lot more of users who have never actually tried the desktop Google Earth to try it now. 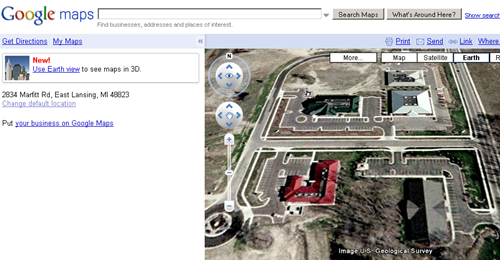 The desktop counterpart still has it’s advantages and features you don’t get in the Google Map view. So I highly recommend trying it out. But, if you have never give Google Earth a try, you should try out the ‘Earth’ tab in Google Maps to get a taste of what you have been missing out on.